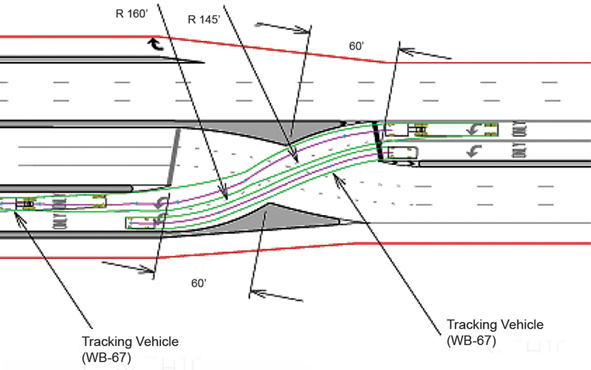 The corresponding technical report, Alternative Intersections/Interchanges: Informational Report (AIIR) (FHWA-HRT-09-060), covers four intersection designs and two interchange designs that offer substantial advantages over conventional at-grade intersections and grade-separated diamond interchanges. The AIIR provides information on each alternative treatment covering salient geometric design features, operational and safety issues, access management, costs, construction sequencing, environmental benefits, and applicability. This TechBrief summarizes information on one of these alternative interchange designs-the displaced left-turn (DLT) interchange (see figure 1). In the figure, the red circle indicates a signal-controlled crossover; the purple circle indicates a signal-controlled main intersection; the orange arrows indicate vehicular crossover movement; and the yellow arrow indicates opposing through movement at the signal-controlled crossover. The DLT interchange is a new interchange design that has similarities to both the at-grade DLT intersection and the double crossover diamond (DCD) interchange. The main feature of the DLT interchange is that left-turning traffic crosses over the opposing through lanes several hundred feet upstream of the main intersection and then proceeds on a new roadway situated between the opposing through lanes and a roadway that carries right-turning traffic from the ramp. From this new roadway, the left-turn traffic completes its maneuver onto the on-ramp. Figure 1. Illustration. Typical DLT interchange movements. A DLT interchange has four signalized junctions: two at the crossovers for the DLT movements and two at the ramp terminals of the interchange. The DLT interchange design reduces the number of phases at the signal-controlled ramp terminals within the interchange from three to two, thereby reducing delays to drivers, pedestrians, and bicyclists as they pass through the interchange area. To ensure the smooth progression of traffic, all four signalized junctions are operated in a coordinated system. A DLT interchange has the same number of conflict points as a conventional diamond interchange. However, fewer angle crashes may be anticipated in a DLT interchange compared with a conventional interchange because conflicts are more separated. Left-turning traffic is displaced from the main intersection by adding lanes that allow traffic to cross the opposing through traffic at a signal-controlled location 400 to 500 ft upstream of the main intersection. Radii of the crossover movements range from 150 to 200 ft, and radii of the left-turning movement at the interchange nodes depend on the turning path of the selected design vehicle (see figure 3). A larger overall interchange footprint may be needed, given that major road left-turning vehicles travel on the opposite side of the roadway, requiring a wider median. U-turn movements on the arterial roads are prohibited in the interchange area, similar to the DLT intersection. Access to adjacent properties is limited by the interchange design, and accommodation of individual driveways is considered on a case-by-case basis. Pedestrians can be accommodated in a DLT interchange as shown in figure 4. Figure 2. Illustration. Typical DLT interchange geometry. Figure 3. Illustration. Left-turn crossover movement in a DLT interchange. Figure 4. Illustration. Pedestrian accommodation in a DLT interchange. A DLT interchange typically has traffic signals at each of the two left-turn crossovers and at each of the two ramp intersections. Signal control at each of these four junctions operate with just two phases for the alternative conflicting movements and are coordinated to maintain progression on the arterial road. Traffic signals at a DLT interchange are fully actuated to minimize delay. A 10- to 22-percent reduction in interchange delays compared to conventional diamond interchanges. A 10-to 15-percent increase in vehicular throughput compared to conventional diamond interchanges. Without any known installations, empirical data on the safety of DLT interchanges is currently unavailable. The DLT interchange and the conventional interchange both have 26 conflict points. However, the DLT interchange may result in fewer crashes because conflict points are more separated. Heavy and balanced through volumes on the arterial roadway. Moderate to heavy left-turn volumes from the arterial to the on-ramp. Low to moderate left-turn volumes from the off-ramp to the arterial. Limited bridge deck width, but right-of-way is available on the bridge approaches. The DLT interchange offers benefits over a conventional diamond interchange with its efficient and simplified two-phase operation resulting in expected increased capacity, reduced delay, and separated conflict points. At the time of this report, there were no known implementations of DLT interchanges. More details can be found in the full AIIR report available from the Federal Highway Administration. Researchers-This study was performed by Principal Investigators Warren Hughes and Ram Jagannathan. For more information about this research, contact Joe Bared, FHWA Project Manager, HRDS-05 at (202) 493-3314, joe.bared@dot.gov. Availability-This TechBrief may be obtained from the FHWA Product Distribution Center by e-mail to report.center@dot.gov, fax to (814) 239-2156, phone to (814) 239-1160, or online at https://www.fhwa.dot.gov/research/tfhrc/offices/safety/. Key Words-Displaced left-turn interchange, DLT, Continuous flow interchange, CFI, and Alternative interchange. Notice-This document is disseminated under the sponsorship of the U.S. Department of Transportation in the interest of information exchange. The U.S. Government assumes no liability for the use of the information contained in this document. The U.S. Government does not endorse products or manufacturers. Trademarks or manufacturers' names appear in this report only because they are considered essential to the objective of the document. Quality Assurance Statement-The Federal Highway Administration (FHWA) provides high-quality information to serve the Government, industry, and public in a manner that promotes public understanding. Standards and policies are used to ensure and maximize the quality, objectivity, utility, and integrity of its information. FHWA periodically reviews quality issues and adjusts its programs and processes to ensure continuous quality improvement.